Mexico City is known as one of the top cities in the world when it comes to traffic and congestion – as a matter of fact it is said that drivers in Mexico City lose an average of 58 hours of their time each year due to peak congestion. Cars have been a staple for many people’s daily commutes to and from their workplace; after all it’s a tool that’s been getting the job done for decades now. But, have you ever wondered at what cost? There are many modes of transportation available today and the majority of the vehicles on the road not only damage the environment but pose the risk of damaging our health as well. Yes, the price one has to pay for convenience is the negative effects it brings about in our environment. What if there was a mode of transportation that is both environmentally-friendly and convenient? Why are electric scooters a great alternative to cars when commuting in CDMX? Mix together all of the best things about commuting by bike, car, and by foot and you’ve got yourself an electric scooter. Renting and riding electric scooters in Mexico City is a breeze – now you can avoid the chaotic traffic jams that paralyze the city on a daily basis and get yourself from point A to point B quickly and efficiently. Fortunately, Mexico City isn’t the only city to begin to adopt the idea of reducing traffic by providing its citizens with the ability to rent electric scooters with a few simple taps of a smartphone. Even more now with the massive fuel shortages that Mexico City has been having to deal with as of late. Below, you’ll not only learn more about the electric scooters available for rent in Mexico City and why they’re so popular but you’ll also find a few Mexico City electric scooter promo codes at the bottom of this article which will give you the opportunity to score yourself a discount and test them out for yourself. Lime Scooters are one of the many options when it comes to renting electric scooters in Mexico City as well as a variety of other destinations around the world. 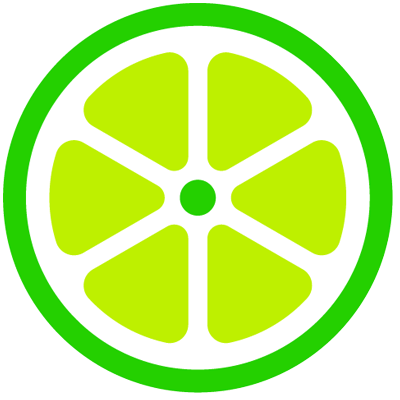 Click here to find a list of locations where Lime is available outside of Mexico City. 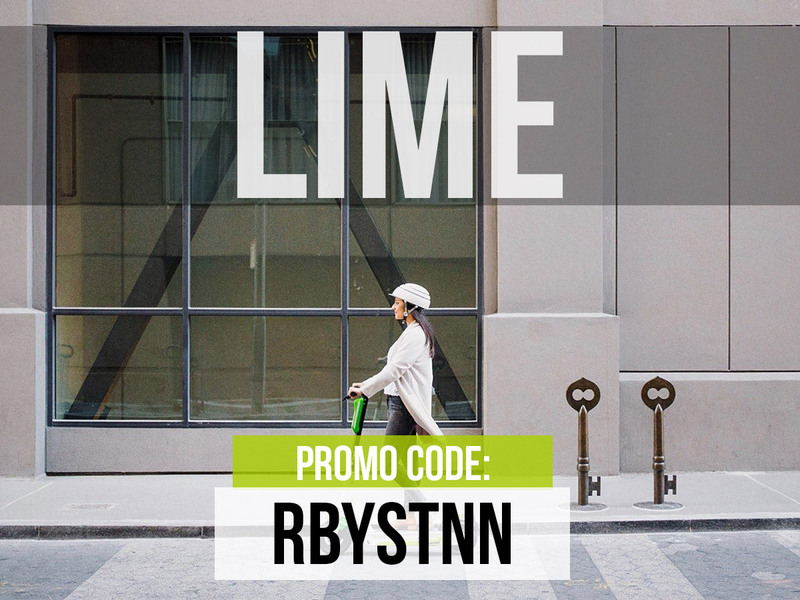 Get your first THREE Lime scooter ride unlocks for FREE using the code shown above! Step 1. Click on the menu icon found on the top-left hand side of your app. Step 2. Click on “Wallet”. Step 3. Under where it says Add a Promo Code, click the View button. Note: This code is valid worldwide. Grin Scooters are a fairly new company which offers electric scooter rentals exclusively in Mexico City. They are currently planning to expand to other parts of Latin America and eventually to the rest of the world. 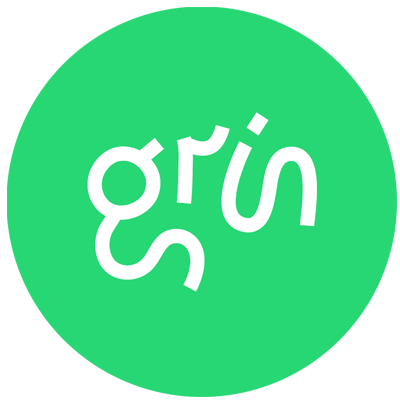 While Grin is recognized as a startup company, they have proven to be a real asset to Mexico City by providing users with a new mode of transportation which cuts down traffic in the city and cuts hours of previously wasted time sitting in traffic each day. 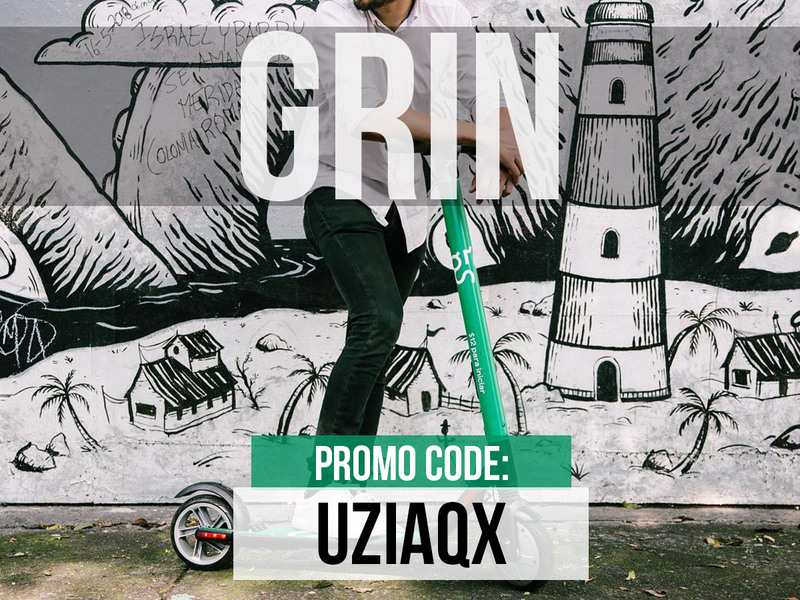 Get your first Grin scooter ride for FREE using the code shown above! Step 1. Click on the profile icon found on the top-left hand side of your app. Step 2. Click on Add coupon. Step 4. Click apply and start your ride! Note: This code is valid for Mexico City and anywhere else Grin operates. 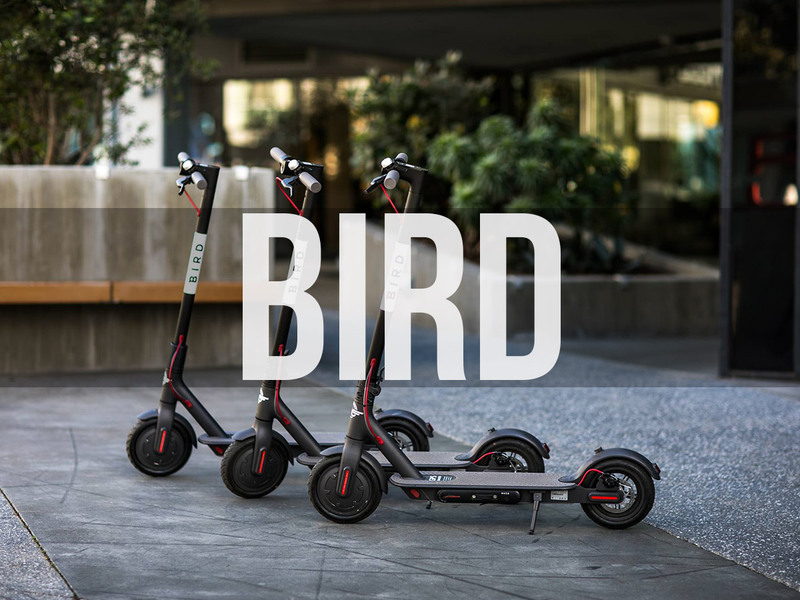 Bird Scooters are an electric scooter rental company that not only have a presence in CDMX but also worldwide — including locations in a wide variety of cities and universities across the United States. Click here to find a list of locations where Bird is available outside of Mexico City. 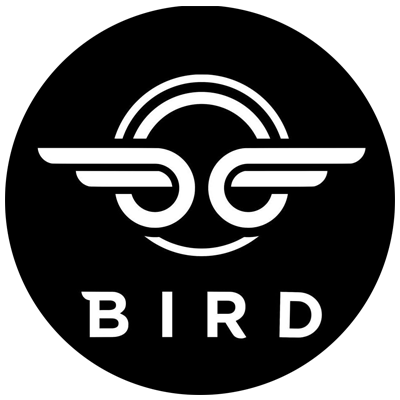 Get your first few Bird scooter ride FREE using the code shown above! Step 2. Click on Payment. Step 4. Click enter and enjoy your free ride! Movo Scooters are a newcomer to the CDMX scooter rental scene. They company is based in Spain and they operate in Mexico City, Madrid, Bogota, Lima and Santiago. 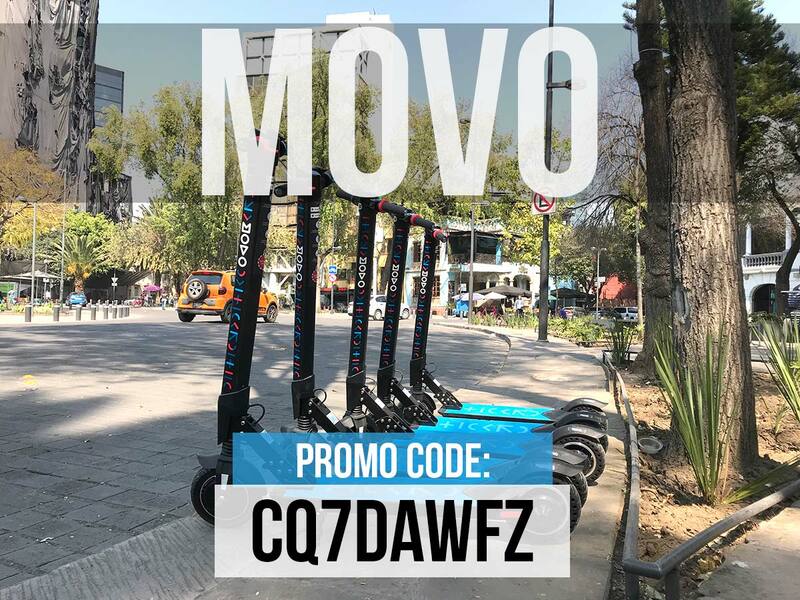 Get your first Movo scooter ride for FREE using the code shown above! Step 2. Click on “Free rides”. Step 4. Insert CQ7DAWFZ and click DONE. Note: This promo code is valid in all cities that Movo operates in. When you take these three companies and compare each one of them side-by-side — all of them have their pros and cons. Lime Scooters will be the most expensive option at 190 MXN/hr. That said, the most convenient electric scooter option in the city is always the one the scooter which is parked nearest to you. You’ll also want to consider your final destination when choosing the right scooter to use as all three of these scooter rental companies have specified zones where you can pick-up and drop-off the scooters. You can learn more about these zones by opening up the respective app of each scooter company and viewing the zones on the map. Not seeing your zone on the map? Well, the good news is that some of the companies also allow users to submit requests to expand their “scooter areas” to be able to access these scooters quicker and also benefit nearby communities. The benefits of using an electric scooter in Ciudad de Mexico is the fact that finding one to ride is as easy as downloading and installing an app on your smartphone. Once installed, finding an electric scooter to rent in Mexico City can be done with a few simple taps on your screen. Locate a scooter on the map and navigate yourself to it. Once you find the scooter, simply scan the QR code found on the handlebars of the scooter to unlock it. With just a couple kicks of your foot to start the scooter, you’re on your way to your destination. It’s really that simple. The process works by using the electric scooter app to locate scooters in or around your area which need to be charged each night. Once fully charge, you then drop the scooters in different locations near to you and you get paid — it’s as simple as that. Note: Each electric scooter company offers different rates to their “chargers” or “juicers” (exclusive to Lime). 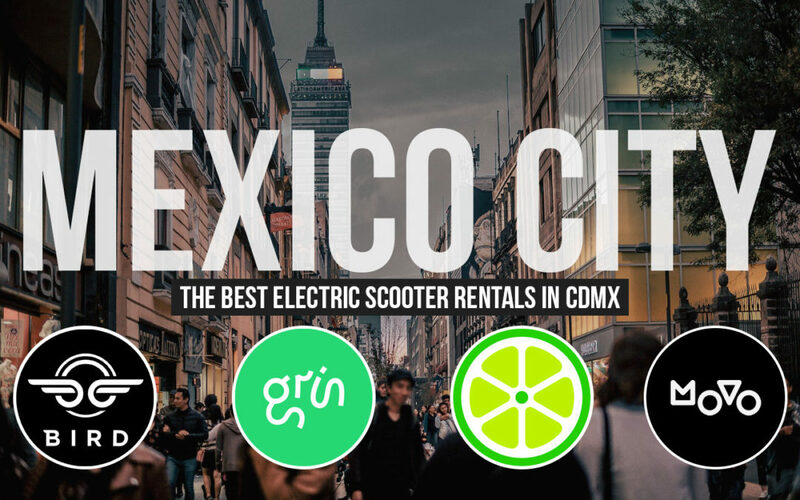 Below, you’ll find the links to apply to be a charger for all three electric scooter companies in Mexico City — Grin, Bird and Lime. The process of being a charger for any of the three electric scooter companies listed above is simple and a great way to earn a little extra side cash. Electric scooters have become a new mode of transportation that answers the need for a change and one that has been long overdue. Cars, trains, and motorbikes might seem to be the go to modes for transportation but the amount of these vehicles not only add towards traffic but also to the overwhelmingly high pollution levels in the city. Be it for work, for class, or simply for leisure – the benefits an electric scooter reaps are both good for the community and the environment.